The Israelis marked by Netanyahu on the list did not donate to his primaries campaign. Those who agreed to donate are mainly American citizens, and few British and French people, including extreme rightists and people who got in trouble with the law. According to estimates, 98% of the funds donated to Netanyahu came from abroad. So basically, it was mostly Americans who got Netanyahu elected. 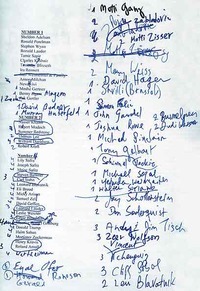 Do check out Bibi's handwritten list of potential donors.